Have you ever told your students to find the “deeper meaning” of a text? Or asked them to share their “deeper understanding” of a concept or skill? Then you, like me, are guilty of one of the most common sins of teaching English Language Arts. Here’s the problem: most kids have no idea what “deeper meaning” and “deeper understanding” actually mean. Worse yet, many teachers are also unclear about this. Often, we simply trust that we’ll know it when we see it. How unfair to our students that they are measured against a standard of performance that we ourselves cannot clearly define! In my school, the “deeper understanding” issue is compounded by years of instruction with the same vague language, particularly for our honors and AP students. This week, armed with handouts, highlighters, and PowerPoints galore, I embarked on a personal mission to set my AP students straight. We began with an excerpt from Martin Luther King, Jr.’s Why We Can’t Wait (the 1989 AP Lang Q2). We worked through the annotation process as with any other text: chunking the text by shifts, writing notes in the margins about patterns and rhetorical strategies, capturing a snapshot of the text through the PASTA acronym. Once we had exhausted our annotation strategies, we turned our attention to Costa’s levels of questions. I provided a simple description of each level along with a picture of a house to represent the foundation, ground floor, and top floor–levels 1, 2, and 3. We cross-referenced this entry-level description with a more detailed handout. Using the handout, we alternated between my think-aloud to model questioning at each level and partner practice. At the end of the period, I collected students’ questions. I returned to the department office triumphant and eager to share with my teacher buddy. We grabbed the stack of papers and started reading their questions. Level one, check. Level two, insightful. Level three…total duds. It was clear that two things had happened. One, some students tried too hard to use the question stems I had provided and hadn’t also built complexity into their questions. Two, some students were so totally stuck in level one and two thinking that their questions didn’t even approximate level three. Even with the flop, I was still excited, though. We were going to tackle this kind of thinking, and it was probably going to mean that I’d be asking my students to operate at a level that they might never have reached for before this class. We have now spent a week writing and responding to questions at all three levels. Today, it clicked. Suddenly, students were debating the qualities of their multiple choice questions, considering the extent to which each question asked them to think about the text’s overall implications. Pardon the phrase, but they took their discussion to a new level. When I decided to use levels of questioning to clear up the “deeper understanding” confusion, I knew that a measure of metacogntition would be important to the task. Never before did I realize just how important that metacognition is to the analytical process. I am learning so much from my students’ learning. Ultimately, the outcome of this experiment points toward some necessary changes. First is the language we use to describe what we want our students to produce or achieve. No more vague phrases! Second, implementing expectations around the use of leveled questions in earlier grades would support our vertical alignment and give us common critical thinking/close reading tools. Finally, students must have a clear understanding of their own critical thinking processes, and they need to be able to intentionally tap into their processes at different times, for different purposes. As author James Stephens said, “We get wise by asking questions, and even if these are not answered, we get wise, for a well-packed question carries its answer on its back as a snail carries its shell.” As we continue practicing the art of asking questions, I am so excited to see my students grow. Interested in more about using levels of questions as a close reading strategy? 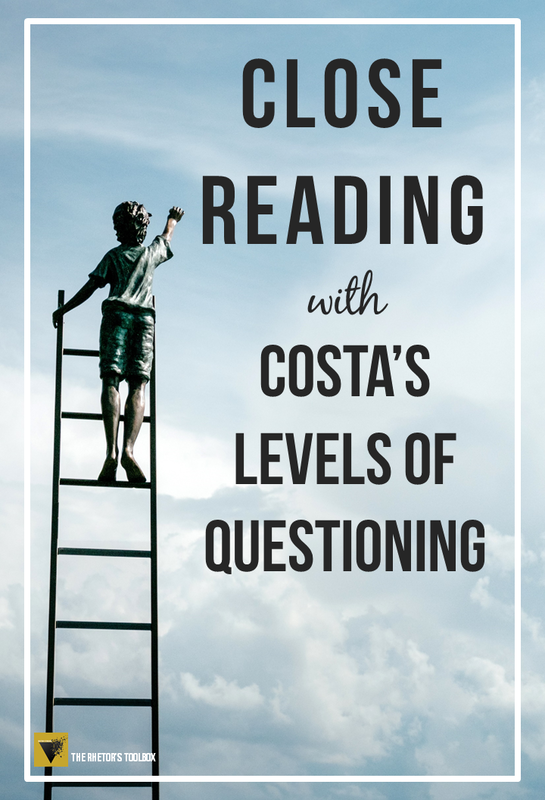 Check out Close Reading with Costa’s Levels of Questioning in my Teachers Pay Teachers store!